Facing a decade of debt, financial analyst turned blogger Michelle Schroeder-Gardner of Making Sense of Cents got to work, side-hustling like her financial freedom depended on it- because it did. I would go to the mall and test out the makeup counter, or I would go to a car dealership and test their customer service, and it didn't pay a ton of money, but I got a lot of things for free that I probably would've used anyways. You're listening to Financial Grownup. With me, certified financial planner, Bobbi Rebell, author of How To Be a Financial Grownup. You know what? Being a grownup is really hard, especially when it comes to money. It's okay, we're going to get there together. I'm going to bring you one money story from a financial grownup, one lesson, and then my take on how you can make it your own. We got this. Hey, friends. Okay, let's have a little honesty here. How much time do you think you spend watching TV, Netflix, YouTube, social media, and so on? Now, let's be real and double that number. I'm right there with you. Focusing on cutting out stuff like excess media helped get Michelle Schroeder-Gardner on the road to paying off her debt and allowed her to hit the road. She now makes six figures a month while traveling around the country, and actually, she's got some international trips under her belt as well, but she's mainly in an RV. I am such a fan of Michelle and her blog, Making Sense of Cents, and I'm excited for all of you to learn exactly how she turned around a boatload of student debt, and created the life that she always wanted and you would probably want too. It's pretty cool. Listen closely and then think about whether you want it bad enough to do it the easy way, and that'll make sense once you hear this, just like Michelle. Here is Michelle Schroeder-Gardner. Michelle Schroeder-Gardner, you're a financial grownup. Welcome to the podcast. You are, of course, the brains behind Making Sense of Cents. Congratulations on all the success around that. Just tell us briefly about your blog. Yeah, so I started Making Sense of Cents back in August of 2011. It was all just a hobby. I didn't know that blogs could make money or anything like that. It was just so that I could talk about my student loan issue that I was having, and living paycheck-to-paycheck, and stuff like that. Soon after I realized that I could make money with my blog and I started making an income from it. Two years after I started it, I actually left my day job as a financial analyst to blog full-time and I will be going on five years of blogging full-time this fall. Amazing. You live in an RV and you're in beautiful Tucson right now, which is amazing. Yeah. We've been RVing for almost three years now and it's really great. Awesome. All right. You brought with you a money story, which sort of ties into your whole blog, or your whole existence right now. You had quite a bit of student debt, but you had a plan. Tell us your money story. I had around $40,000 in student loans. It all started when I of course went to school, went to college for my undergraduate degrees. Webster University in Saint Louis, it's just a small college there. Okay, but a private school? Yep, a private school. I went there and I had two undergraduate degrees, business and management. I just didn't really think anything of student loan debt. I just thought the average person has 30 to $40,000 in student loans and if everyone else is doing it, then I would be fine with it too. I just continued to take out student loans, even though I was working full-time, I probably could've paid it down, I probably could've left school with no student loan debt, but I just wasn't smart about it. When I graduated I had around $35,000 in debt, and then I worked for a little bit as a financial analyst, and at the same time I went to school again for my finance MBA, and then I gathered a little bit more student loan debt. This time not as much, but after that I had around $40,000 in student loan debt. Was there a moment where you sort of ... Where you looked at the bill and you kind of decided, "Oh, maybe I need to do something proactive?" It was actually when I received the bill. I received my first student loan bill and it wasn't like an actual bill, it was just telling me, "Six months from now you're going to owe this amount of money each month." I can't remember the exact amount. It was like $750 or $1,000 a month and it was for the next 10 years or something. I just thought, "That is an insane amount of money to pay for the next almost decade." I definitely did not want that debt hanging over my head for that long, so that bill is exactly what got me into ... It's what got me motivated to pay it off. Okay, so what was the plan? I decided I was going to pay off my student loans as quickly as I could. My plan was actually to pay it off within six months, but I actually paid it off within seven months. Still a great amount of time, of course. Yeah, so I'm not upset at all. Yeah, I just decided I was going to pay it off as quickly as I could through mainly side hustling and cutting down my budget as well. Specifically, what did you cut and what did you increase your income through side hustling? We lessened the amount of times that we ate out, we got rid of our gym memberships, and we negotiated all of our bills, our cellphone bill, insurance, and stuff like that. It was mainly side hustling that helped me improve or be able to pay off my debt a lot quicker. What side hustles did you do? I did a ton of different things. My biggest one was definitely blogging on Making Sense of Cents, but then I did a lot of others things that anyone can do. I mystery shopped. The company I used is called BestMark, but I would go to the mall and test out the makeup counter, or I would go to a car dealership and test their customer service, and it didn't pay a ton of money, but I got a lot of things for free that I probably would've used anyways. Like an oil change, or makeup that I already used, or a dinner out. Then I did a lot of other things, like I took part in research studies online or phone call research studies. I also sold items around my home on eBay and other places online. I staff wrote for other websites. I managed social media for other companies. I just did a lot of different things and I was working 40 hours a week on top of my day job as a financial analyst just side hustling. Wow, so it was really not a side hustle. It was a double hustle. What is your lesson for people to take away from that story? Because a lot of people might say, "Yeah, she could do that, but I'm really busy, or I'm so tired when I get home from work, I just can't do it, oh." I hear that a lot and I always like to point out, I probably say this in every single interview that I'm in, is that the average person watches over 30 hours of TV a week. You're probably thinking, "Oh, I don't watch that much TV a week." I mean, if you just watched a couple hours after work every day, I mean, that's easily going to equal over 30 hours a week. Even if you could just take back half of those hours, or maybe a majority of those hours, I mean that's all time that you could put towards your side hustling. That's just cutting down how much you're watching TV. There's tons of other areas where you could cut down your hours. I mean, it's all about time management. If you want to pay off your debt, I mean, you'll find ways to find that time. Everyone says that they're busy. Trust me, I thought I was super busy and people thought I was crazy, but I found the time to side hustle or double hustle like crazy. Exactly. It's okay if you're not caught up on the latest TV show or whatever, people understand. Yeah, no one's going to judge you. Well, I want you to give us a money tip and it's sort of related to all of this, because you want to talk about side hustling. What are some specific ways that people, for your money tip, that people can earn that extra side hustle money? Definitely the top money tip is analyze where you're wasting time and side hustle. My other big tip is if you want to side hustle, especially side hustle a ton like I did, find things that bring you joy. I really liked finding items to sell. I loved mystery shopping. I really love blogging, and managing social media, and stuff like that. If you are able to find joy in the way that you're side hustling, that'll make the time pass much more quickly, because it seems more like a hobby than instead of you taking on a second full-time job or something like that. Definitely find the passion in your side hustle. It's a good way to leverage whatever you're passionate about. I mean, if you love shopping, then being a mystery shopper is a perfect way to merge the two, because you're not even spending your own money really. You're getting free whatever. You're getting reimbursed for whatever just to give your opinion and you still have a lot of the feeling and the thrill of shopping. Yeah, exactly. That's why I really loved mystery shopping, because I was still shopping and still just buying products that I would normally buy. Exactly. All right. Where can people find you, learn more about you, and get in touch? I mean, the best way would just be to go to makingsenseofcents.com. I also have a Facebook community, Making Sense of Cents Facebook community, and then if you want to follow my RV travels, I definitely recommend going to my Instagram account, which is Instagram.com/MichelleSchro. Travel ideas, especially when you were in the Islands. I definitely have my eye on some of those trips. A lot of what Michelle had to say made so much sense, especially when we are really honest about how we're spending our time and whether we're really intentional and focused when we have goals like paying down debt. Financial Grownup tip number one, you have to work for it, but you don't have to do the things that will make you miserable. I love Michelle's great attitude about her side hustles. It sounds like she might even do them now, maybe not, because she's busy on her RV traveling the world, but they were fun for her and key, they paid, and it was all good. When looking for side hustles, try to figure out things that make sense in your life and in your lifestyle, where you want to be, what you want to be doing. Things that you might be doing anyway, just like Michelle did. She did put in a lot of hours, but she had a good time with it. Financial Grownup tip number two, talking about your life on a blog can both motivate you to accomplish your goals and it can create income. Making money blogging is not a given. It is hard work, but people that focus and do the hard work, like Michelle, do pull it off. You may not get to six figures a month like Michelle does with Making Sense of Cents, but that doesn't mean you won't see a payoff in other ways. I'm going to leave some links in the show notes for you so you can learn more about what Michelle does and maybe get some tips directly from Michelle from her courses. Thank you everyone for listening to this episode of Financial Grownup. If you haven't already subscribed, hit that button for me. I want to make sure you don't miss any upcoming episodes and reviews are great. I know that they take time, but if you have the time they are appreciated and they really help let other people know what's going on with the show and maybe they can discover it and enjoy what we're doing here as well. You can follow me on Twitter @BobbiRebell, on Instagram @BobbiRebell1, and of course, learn more about the show and catch up with other episodes at BobbiRebell.com/financialgrownuppodcast. 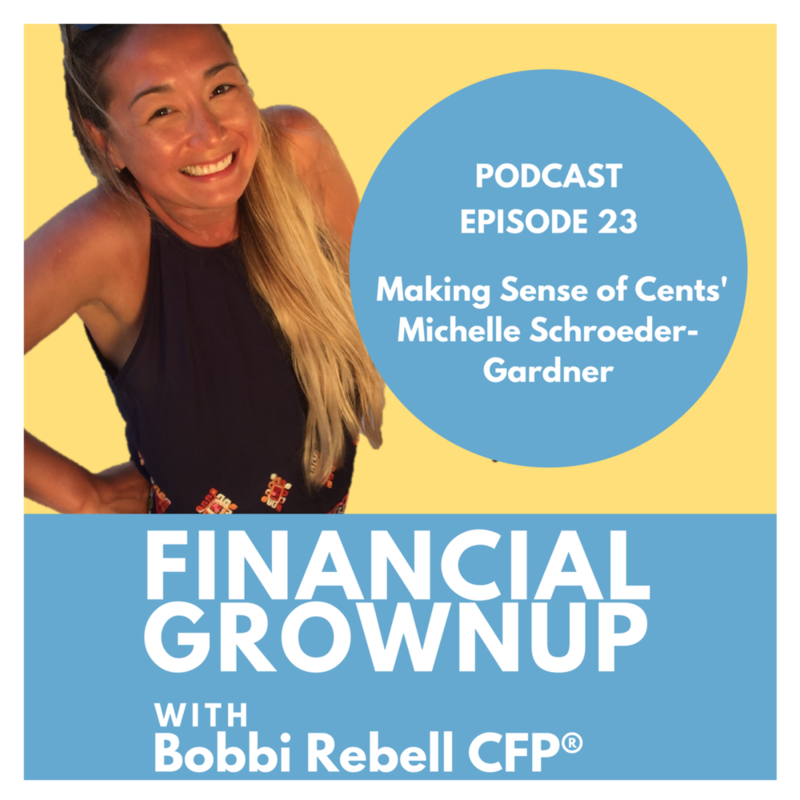 I hope you enjoyed this episode with Michelle Schroeder-Gardner and that we all got one step closer to being financial grownups. Financial Grownups with Bobbi Rebell is edited and produced by Steve Stewart and is a BRK Media production.